We have the powerful square built chows. ShenLung is long hair rough, FengHuang was a smooth with some rough main and pants, FuShiLu is the shorter rough hair. All ours have the massive feet and build, they are not slow though and ShenLung and FuShiLu can jump like few others. Faces very square, broad and short snouts. This has always been our favoured look. However the look you like is the love you look for. joghz wrote: YEsterday, I and my family together with Nutella Waynewent to this Pet Village to show my mom some new pups. When we stepped into this shop, one sales lady noticed my Chow and said, why is your Chow so thin??! I told her, he's not thin. he's fit and heavy. I got pissed off and I asked my family to just go. My Wayne is very strong and has legitimate registration and license. I don't know how to explain to her that Wayne is a Chow. not a mix breed whatsoever dog. 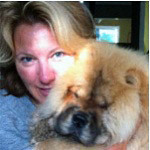 He's not just a Chow Chow, we treated him as my son. Next time someone compares their "standard" with yours, you can tell them there are plenty of documents that can be found in books and online including photos of what Chows chows look like. And that your chow is closer to the original that came from China while theirs are the result of extreme and in most cases unhealthy breeding for sport. Meet my Chichi... She's 2 months and 3 weeks now. Before i adopted her she has purple/black tongue and pink spots but 2weeks after it turned more purplish/black and have just 2 pink spots now.. I'm still not sure if shes a purebred chow tho.. ♥ but she's a cutieee. What do y'all think?